The latest Abacus poll shows a tie nationally between the Liberals and the Conservatives, not much different from polls last month. However, as usual in federal seats projections, the provincial/regional breakdown is really what matters. In this case, the Liberals have enough of a lead in the Atlantic and in Quebec to overcome a deficit in Ontario (and pretty much everywhere else in the West). This is new. This is also the first time in months that the Liberals would have a higher chance of winning the most seats than the Tories. When was the last time the Grits won an election without winning the most seats in Ontario? If anybody knows (I'm lazy right now), please let me know in the comments. Specifically, the Liberals are behind by 6 points in Ontario (32% vs 38%) and would only have a little bit over 10% chances of winning the most seats in this province when we account for the uncertainty of the poll as well as of the electoral system. Usually, and especially for the Liberals, this would mean game over. But this time around, their lead is so insane in Atlantic Canada (they stand at 56%!) and, to some extent, in Quebec (first with 34%, ahead of the NDP at 26%), that it would actually be enough to retake power. Make no mistake though, it'd be pretty close and the chances of winning are almost 50-50. Specifically, Justin Trudeau would have 54% chances of becoming the next Prime Minister. He would only get a minority though. And I'm not using the new maps with the additional seats. Given that these seats are in provinces where the Conservatives are leading, it is well possible that Stephen Harper would remain PM. For both parties, chances of a majority are currently at 0%. Well, techically, there are 3 simulations out of 5000 where the LPC gets a majority. But you see what I mean. Notice that the seats range is wider for the Liberals. It shows that the Conservatives seats and support are more stable and firm. In this case, it's mostly because of Quebec. For the Tories, it doesn't matter whether they are a couple of points over- or underestimated in this province. But for the Liberals, a couple of points means a lot of seats. So the simulations have a greater impact on the Liberals' total number of seats than on the Conservatives. These numbers look good for the Liberals (except in Ontario), but not as good as the numbers from the latest Forum poll. In this one, the Grist would cruise to a probable majority. I decided not to use the Forum polls for these projections because the numbers just seemed weird to me. If it was an election, I'd include it, but for now, I chose to display the projections based on the Abacus one only. In the Forum one, numbers in Quebec in particular are very different (from Abacus as well as a recent Leger). Forum seems much harder on the NDP. For instance, they find that as much as 33% of NDP voters in 2011 would now vote Liberals. For Abacus, it's only 21%. Also, Forum has the Liberals actually ahead in the Prairies. If that was actually the case, it'd be a pretty big swing compared to the last election. Anyway, if you think Forum is right just input its number in the simulator. One interesting thing to look at is the Bloc in Quebec. The number of seats this party can win varies quite a lot. It really seems that dropping below 25% is like a treshold for this party. So the projections are very different depending on whether we use a poll with this party at 19% as in Abacus or at 27% as in Forum. Hopefully, if this was an election, we'd get tracking polls daily. 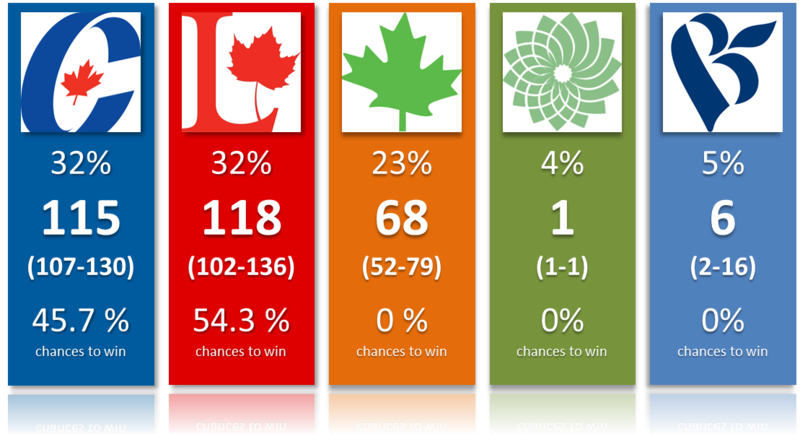 We'll see next month if these numbers align with the byelections results.